It wasn’t that long ago that salad for tea meant a bit of limp lettuce a slice of tomato, half a hard-boiled egg and a slice of tinned ham, which always came in an acorn-shaped tin. With bread and butter and a bottle of salad cream to accompany it. And if you went out to eat and asked for salad it was assumed you were on a diet! Fortunately things have changed a bit since then. Now we have salads that can be a complete meal in themselves, or served as tasty side dishes with flavours that originate from all parts of the world. Eating salad is a great way of getting some of the 5 daily portions of fruit and veg recommended for a healthy diet, but there was a time when you’d have been signing your own death warrant if you’d eaten fresh vegetables! A few hundred years ago, food handling and storage practices weren’t very hygienic! But nowadays a variety of salads are offered in every restaurant and you can create your own at home with just about any ingredient. What matters is that the ingredients are fresh and that the dressing complements them.Two of the most famous salads are American in origin. The Waldorf Salad was created in the Waldorf Astoria Hotel in New York in 1893, while the Caesar Salad was the brainchild of Caesar Cardini, in Tijuana, Mexico, in 1924. They can be served as an accompaniment or make delicious meals on their own. Wash and dry the apples then core and chop into small cubes. Toss in the lemon juice to stop them going brown. Mix the apples, celery, walnuts and mayonnaise together, and serve on a bed of a few crisp lettuce leaves. Preheat the oven to 180o C, gas mark 4, and grease a baking tray. Heat the butter, oil and garlic in a small pan. When it’s warmed through, turn off the heat and leave it to stand for about 10 minutes to allow the oil to absorb the flavour of the garlic. Meanwhile, remove the crusts and cut the bread into ½” cubes. After 10 minutes, discard the garlic and toss the bread in the oil, making sure it all gets coated. Put the bread cubes on a baking tray and cook for 10-15 minutes until golden brown. Now make the dressing. Put the egg in a small saucepan of cold water and bring to the boil. Boil for 1 minute then remove from the heat and cool quickly under cold water. When the egg is cool enough to handle break it into a jug and add the crushed garlic, lemon juice and Worcestershire sauce. Mix together well. Gradually add the oil, stirring all the time. Tear the lettuce leaves into small pieces and place in a bowl. Pour over some of the dressing and toss together to coat the leaves. Add the croutons and parmesan cheese, and repeat the tossing with some more dressing. The salad leaves shouldn’t be soggy but just nicely-coated. Serve immediately. You can make your own version of this pasta salad using whatever ingredients you like best. You might want to throw in some raisins, cheese, peanuts or apple chunks, or you could add tuna, ham or chopped up cooked sausages, to make it more substantial. We’re using ordinary mayonnaise for the dressing but you can use any low-fat mayonnaise or dressing you might prefer. Cook the pasta, peas and sweetcorn according to the instructions on the packets. Drain and rinse under cold water. Drain again well. Place the pasta in a serving bowl and stir in a teaspoon of olive oil to help stop it sticking together. While the pasta is cooking, remove the core and all the seeds from the red pepper, before chopping into small pieces. Cube the cucumber (little cubes) and chop up the spring onions. It will look neatest if you can get all the vegetables about the same size but, however you cut them, the taste will be the same! Add the vegetables to the pasta and stir in the mayonnaise and lemon juice, making sure everything is coated. This is a simple and useful dressing to make as it transforms any collection of leaves or vegetables into something quite different and very tasty. It’s basically vinegar and oil with seasoning but the important bit to remember is that there should be about 6 times as much oil as vinegar. Mix them all together! If you have a small screwtop jar you can shake them together in that or just stir vigorously. They will separate on standing so make just before you’re about to use. Or if you have to leave it for a while, stir it again before use. 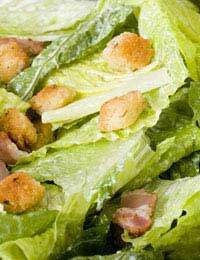 Drizzle some over your mixed lettuce leaves (or salad) and toss so that all the leaves get some coating. Don’t use too much as you don’t want soggy lettuce. Better to add a little at a time until it’s just right.